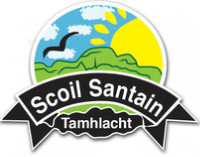 Fáilte go suíomh gréasáin Scoil Santain. Is Gaelscoil Chaitliceach muid i dTamhlacht ,Baile Átha Cliath. Bunaíodh an scoil i 1979 le 32 dalta agus beirt mhúinteoir agus faoi láthar tá breis 's 340 pháiste, idir bhuachaillí agus chailíní ag freastal ar an scoil. Tá foireann de 24 mhúinteoir againn anois . Tá an páiste mar chroí lár na scoile agus caitheann siad an lá ag foghlaim trí mhéan na Gaeilge ar bhun ghníomhach, taitneamhach agus oideachasúil. Bíonn ‘Céadaoin na Coisíochta’ gach Ceadaoin. Moltar duit siúil le do pháiste ar maidin is um thráthnóna más féidir leat. Tá sé an tabhachtach go dtacaíonn tú le seo ar mhaithle aclaíocht, sláinte is sonas do pháiste. ‘Walk on Wednesdays’ is ongoing every Wednesday. We ask that you walk with your child in the morning and home in the evening, if at all possible. It is important that you try and support this initiative as it helps to promote fitness, health and a sense of well being in your children. Tá cúrsa ceithre seachtaine áilleachta agus gruaig ag tosnú Dé Céadaoin, 20ú Feabhra, i Seomra na dTuistí. Beidh na séisiúin ar siúl gach Céadaoin ó 9.30 go 11.30. Tá táille de 5 Euro ar an gcúrsa. Le tuilleadh eolais labhair le Múinteoir Pól san oifig le do thoil. A four week course in hair and beauty will begin on Wednesday, 20th February, in the Parents' Room. The sessions will take place every Wednesday from 9.30 to 11.30. There is a 5 Euro fee for the course. For more information please speak to Múinteoir Pól in the office. Beidh na ceachtanna Gaeilge ag tosnú arís maidin Déardaoin seo chugainn i Seomra na dTuistí @ 9.10. Fáilte is fiche roimh gach éinne. Le tuilleadh eolais labhair le Múinteoir Pól san Oifig le do thoil. Irish lessons will recommence this Thursday morning in the Parents' Room @ 9.10. All are welcome. ​For more information please speak to Múinteoir Pól in the Office. Bíonn léitheoireacht roinnte ar siúl le páistí Rang a 1 gach maidin Chéadaoin idir 9.10 go 9.50. Bíonn na tuistí ag cabhrú is ag treorú na bpáistí ina gcuid léitheoireachta. Dá má mhaith leat cabhrú linn labhair le Múinteoir Pól san oifig le do thoil. Paired reading takes place every Wednesday morning, between 9.10 and 9.50, with children from First Class, who are guided and helped in their reading by parents of the school. If you would like to help, please speak to Múinteoir Pól in the office. taillí a íoc don Leabhair ar chíos ,Airgead Áiseanna agus Árachas ag an nasc seo. Parents /Guardians are welcome to use this facility to pay for your Book Rental ,Requisites,and insurance fees at this link.